Sam is a typical twelve-year-old boy who works on his parent’s farm, but is not as interested in horses as his horse-training family. However, he does his best to help out until an incident when he is riding with his mother. After saving her from becoming nearly trampled, his viewpoint changes … until a strange horse comes to their farm with quirks, earning him the name Dog. Dog likes Sam right away, but Sam wants nothing to do with him, as he is the son of Trumpeter, the horse that nearly maimed his mother for life. Sam has a hard time dealing with not only the memory of the accident, but the extra chores and responsibilities suddenly thrust upon him, one of which is training Dog. Because his mother is out of work and people are canceling orders, money is scarce. With the Indiana Classic coming up—a local horse race with a huge purse—will Sam be able to befriend Dog and save their farm, or will Dog go back to his present owner, never to be seen again? 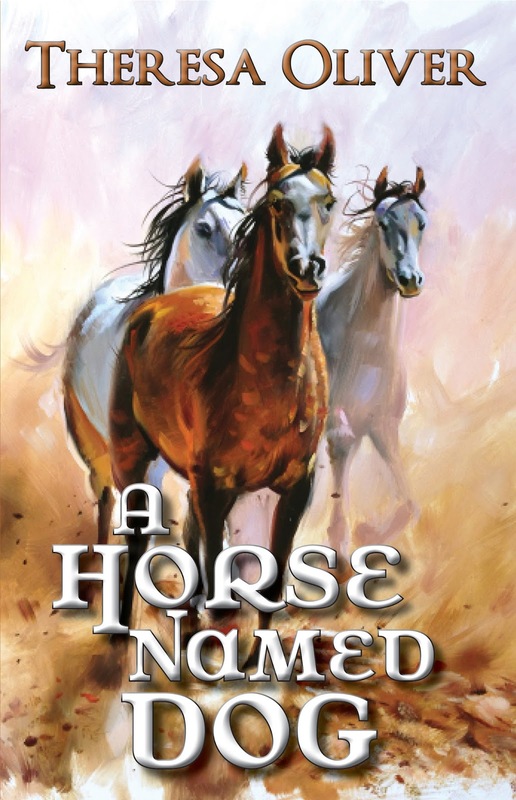 Find out in Theresa Oliver’s first pre-teen novel, A Horse Named Dog. He quickly swung himself into the saddle and got his foot into the stirrup just as Dog started bucking wildly. He held on to the saddle as he started giving him voice commands, trying to settle him down, but Dog wanted no part of it. A moment later, Frank was lying face down in the dirt again. Dog ran toward the other side of the corral, whinnying loudly as he paced nervously along the fence row, the reins dragging along the ground behind him. Then, he looked over at Sam and looked at him as if telling him what the humans were trying to do to him. Without thinking about it, Sam jumped down off the fence and started toward him with his hands extended. “Son, no!” Frank yelled, getting quickly to his feet. Sam ignored them, focusing only on Dog as he looked into his eyes, seeing into his soul. “I know, boy, but you have to let them ride you,” Sam cooed, understanding what Dog was thinking. “We have to break you, which means that you have to let us ride you.” Dog shook his head back and forth nervously. “Shush, boy. It’s okay. You’re going to be a famous racehorse one day, but we need to be able to ride you first. Shush.” Sam stepped up in front of Dog and rubbed the soft white patch of fur between his eyes. “That’s it, boy.” Then, he reached out and took the reins, and leaned his forehead against Dog’s. The horse immediately calmed. Sam looked up into his eyes. “Are you going to let me ride you, boy?” Dog shook his head back and forth. But Sam ignored him. “Come on, boy. You’re a big boy now. It’s okay,” he said, as he leaned his head against the flat of Dog’s cheek. Soon, Dog calmed down. Sam pulled back and looked into his eyes again. “I’m going to ride you now,” Sam cooed. “I’m not going to hurt you.” Dog bobbed his head up and down, nickering nervously as Sam ran his hand along his neck, gently placing the reins on either side. “It’s okay, boy,” Sam cooed as he placed his hands on the horn of the saddle and one foot in the stirrup as Dog looked around at him, stretching his long neck around, but held still as he looked forward again. Sam stood in the saddle, as his father had done, with one foot in the stirrup. Dog whinnied loudly, but held still as Sam paused. “It’s okay, boy. I’m not going to hurt you.” Sam braced himself as he held the reins in one hand and quickly swung his leg over the saddle, quickly sliding his foot into the stirrup on the other side, holding the reins tightly. Immediately, Dog started trotting around the ring, whinnying loudly, but made no attempt to throw him off as he paced around the ring. His father and Carlos jumped quickly onto the top of the fence, staying out of the way, but ready in case Sam needed them, as they watched. Sam let Dog trot around the ring as he whinnied loudly. “Whoa, boy! It’s okay, boy!” Sam cooed as Dog trotted nervously around the ring. Before long, Sam sensed that Dog started getting used to him on his back, so he decided to use the voice commands. He clicked his tongue and said, “Trot!” and a few moments later, Dog broke into his beautiful trot. Sam decided to push the envelope and leaned forward. “Canter!” Immediately, Dog broke into his canter, a bit choppy at first, but then he relaxed, finding his rhythm. Sam cantered with Dog around the ring a few times, laying the reins on the side of his neck to guide him, and Dog obeyed. Then, he turned Dog around and cantered in the other direction, laying the reins on the other side of his neck, getting him used to being reined. After a few minutes, he pulled back on the reins slightly. “Walk!” Dog immediately slowed to a walk, throwing Sam over the top of him, but Sam wrapped his arms and feet around Dog’s neck, holding on. Dog immediately came to a stop. Sam looked up, and Dog was looking down at him with an expression that asked what he was doing down there. Then, he nuzzled Sam, trying unsuccessfully to lick the side of his face, but couldn’t because of the bit in his mouth. “Cut it out, Dog!” Sam said as he turned his face to the side, still hanging on. Immediately, his father and Carlos ran across the corral to him. His father wrapped his arms around him. “It’s okay. Let go, son. I’ve got you,” he said, and Sam did as he asked as his father helped him to his feet. Then, he pulled him to his chest for a tight hug. “That was amazing, son! I’m so proud of you!” His father kissed the top of his head. Theresa Oliver grew up in southern Indiana, across from Louisville, Kentucky, in Clarksville, Indiana. In her childhood, she fell in love with the power of the written word, a love affair that has continued her whole life. She moved to Florida, where she has lived much of her adult life. She attended the University of Tennessee at Martin, Martin, Tenn., and earned her Bachelor of Arts in Communications degree, News Editorial sequence. She also earned a Master of Arts in Teaching degree, Early Childhood Education sequence, from Armstrong Atlantic State University, Savannah, Ga. She is currently a writer, a full-time teacher, and the owner of Write More Publications and TNT Author Services. However, her greatest adventure is as a mother of three beautiful boys. Oliver currently resides in Kissimmee, Florida, with her husband and children.